In an attempt to gain a better understanding of Asian consumers’ demand for less hazardous alternatives to cigarettes, Asian consumer advocacy group Factasia commissioned a first-of-its-kind survey across South-East Asia. 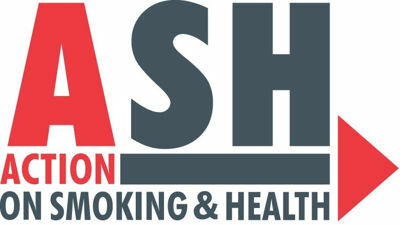 Recently revealed results show the vast majority of adult smokers see e-cigarettes as a positive alternative to smoking. The survey was conducted by international polling company Ipsos, in six major Asian markets. Although final results have not yet been published, the data revealed so far suggests smokers in Asia would like to see their governments handle alternatives to tobacco, particularly electronic cigarettes, a little differently. 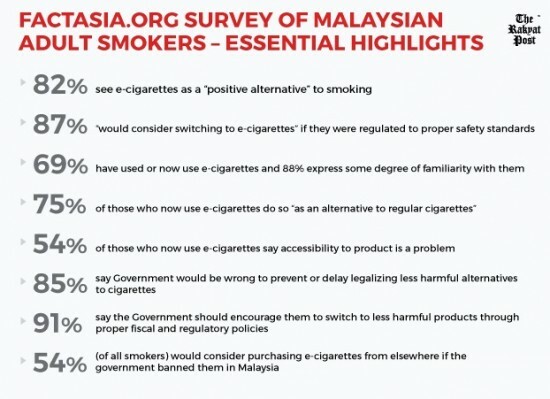 In Malaysia, where the number of e-cigarette users is somewhere between 250,000 and one million, 90% of adult smokers said the government should encourage smokers to switch to less dangerous alternatives and make them more easily accessible, while applying moderate regulations to ensure proper safety standards. 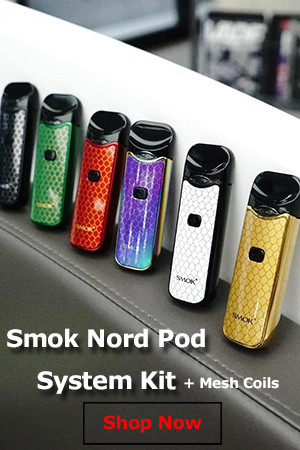 More than two third of polled smokers said they had used electronic cigarettes and of these, 75 percent said they did so primarily “as an alternative to regular cigarettes”. 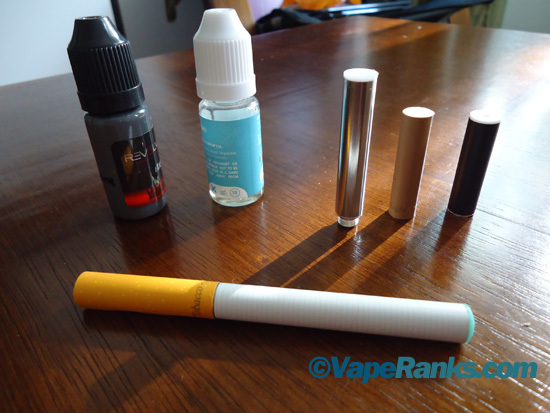 83 per cent of smokers see e-cigarettes as a “positive alternative” to tobacco products. 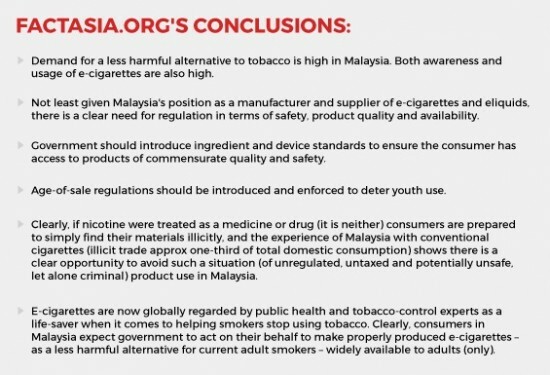 There is a clear need for action in Malaysia to regularise the industry and to establish quality standards, tax the products rationally and ensure they are made available only to adults, like many other consumer items,” Factasia co-founder Heneage Mitchell said in a statement. The survey polled 404 legal-age smokers during the May-June 2015 period using online interviews. 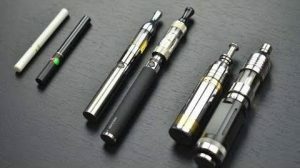 The findings come after police announced they were looking into claims that dangerous drugs were being added to e-liquid cartridges for e-cigarettes to get users addicted. Reports mentioned a drug syndicate allegedly creating new e-liquid flavors infused with cannabis and ketum leaf extracts. Things weren’t much different in Singapore, where an overwhelming majority (79% of respondents) said it was wrong of the government to prevent or delay the introduction of potentially safer alternatives to smoking. 87% of Singaporean smokers feel their leaders should encourage people to switch to less dangerous alternatives “through tax and regulatory policies”, while ensuring they are not used by youth. Singapore has taken a very hard stance against electronic cigarettes, prohibiting the sale of vaping-related products and their use in most public places. 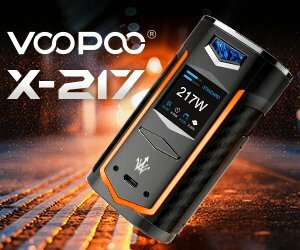 Things are expected to get even worse for vapers in the island nation, as even more draconian regulations are scheduled to come into effect in December 2015. The ban on electronic cigarettes has recently been slammed as unethical, unscientific and harmful to health by reputed British scientists Professor Gerry Stimson, of Imperial College London, and Clive Bates, a longstanding tobacco control campaigner. In an open letter to Singapore’s Ministry of Health, they claim that by banning low risk alternatives to tobacco, Government is protecting the cigarette trade at the expense of smokers’ health. Finally, the Factasia survey conducted in Hong Kong – where electronic cigarettes are currently banned – found that the majority of smokers (66%) want to be able to switch to less dangerous alternatives, while 60% said the Government should not delay or prevent legalizing such alternatives. “It is clear that the vast majority of Hong Kong’s 650,000 smokers want e-cigarettes to be legally available and many would make the switch to this less harmful alternative if they could. They also believe that the Government should not prevent or delay their right to exercise this choice,” John Boley said. “There is obviously consumer demand in Hong Kong for the right to choose. There is also a massive body of international scientific research that shows that their use can be consistent with wider public health objectives that benefit all of society. Rather than banning them, the Government has a great opportunity to become a clear leader in Asia in progressive public health policy and in harm reduction in this vital sector. It should regulate them effectively and make them widely available,” Factasia co-founder Heneage Mitchell concluded. Results of the Factasia survey conducted in the remaining three Asian countries are scheduled to be published in the coming weeks.